Internet marketing tips for your small business. With January over, it’s a sure bet that many of those tidy 2011 Internet marketing resolutions you set for your business have given way to putting out client fires, plowing through a stuffed inbox, and taming the overflowing file repository you used to call a desk. 1. Clean up your language. Really look at your website from a customer or prospect’s point of view. Are you calling things on your site the way your sales team talks about them during their weekly meeting or the way your customers understand them? Is your site full of phrases like “leverage strategic alliances” and “monetize consumer engagement”? Nothing makes a prospect glaze over faster than market-speak. 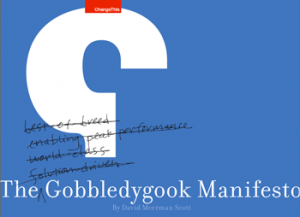 If you want more info on what type of language should not be on your site, grab the Gobbledygook Manifesto. It’s now several years old but more relevant than ever. Do you have links that are potentially confusing to a current customer? For example, customers don’t necessarily make the distinction between the words “help” “support” “faq” “documentation” forum and wiki. All they know is they have questions they want answered. Help them get to to the right destination. Are you trying so hard to appeal to everyone that you are actually appealing to no one? How much of your site’s content and/or functionality does not focus on your core customers or prospects but on the “one-offs” and “what-ifs?” So many times we see clients who are so afraid of “excluding” someone that they want to pile on the links and amp up the amount of text on the home page. You don’t exclude customers, you simply INCLUDE a focus. People are really good at self exclusion, and if you don’t provide very well what a few people want, well then that simply frees you up to be really good at providing what most of your customers or valuable prospects want. Now look at your home page, your site navigation, are these elements speaking to those who really matter to your business? Do you have pages dedicated to “links” or “partnerships”? Does your customer base care about those things? If not, (and don’t kid yourself, for most business, they are not as important to the customer as you would like them to be) then why are they taking up so much space on your home page or navigation? You don’t have to get rid of them…just make them less prominent so the stuff your customers really want to know can shine. You are hereby released from appealing to everyone. Determine where your best bets are and FOCUS on those. Strategic reviews are perfect for this. 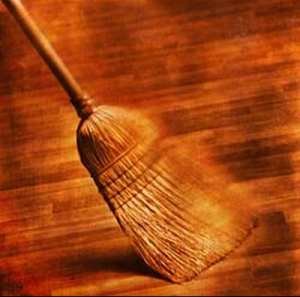 “Clear the decks” is a phrase that can be found in Barbara Sher’s book “Live the Life You Love.” Her point is that giving your home a thorough “spring cleaning” or decluttering your space can really prepare you to make and follow through with much bigger, more productive plans. Well we feel the same is true of your website. Spend some time simply clicking around on your site to re-acquaint yourself with all of its features. Many times we find business owners lose touch with the nuts and bolts of their website after it’s built, and forget what functionality is available or even how to use it! If you run a site that is at all transactional in nature …when was the last time you reviewed your site’s FAQs? Are they still relevant? Has functionality on your site changed but no one bothered to change the site’s FAQs or help files to reflect those changes? Do you have other content on your site that is not only passé but inaccurate? Now, we’re not talking blog posts, but pages that describe the products and services your business offers. This is a problem that larger sites can have very quickly in just a few years. If your site is less than 25 pages, then you have no excuse for inaccurate info. Even if you can’t remove/change the content yourself, just open up your favorite document editor and make a list of the offending URLs with notes on what needs to be corrected. Then hand that to your webmaster or whomever updates your site. The key here is to include the URLs, not just what you happen to call the page. Finally, are there things that bug you about your site? Things that you would like to add to your site? Great. Make two lists and write them all down. Get them out of your head and into a place where you can objectively judge and prioritize them. There, now doesn’t that feel better? Even if you are a small local business and even if you have a small website and even if you aren’t ready to Tweet or Facebook your way to business success, there are still some very simple ways you can be on the lookout for what others are saying about you. 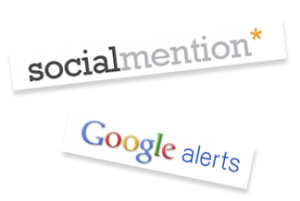 The fastest thing to do is set up a Google Alert or use SocialMention. Easy and free. What do you do with the information? Well, we’ll save that for another post. Right now, just get it set up so you will know if anyone has said something nice or bad about your company. Now it’s time to check your local presence on Google Places, Bing, et al. Go to GetListed.org. Type in your business name and zip. This service lets you know at a glance your status on the major local listing services. If you are listed and your listing is not claimed, claim it. Immediately. Once all the references to your business are in your name, by all means, make sure your information is correct and updated. Use the insight gained in steps 1-4 to begin a plan for updating your online presence to match this year’s marketing and business goals. You can start with a clear, focused mind because you know your challenges, you know your audience, you know how you appear online and best of all, you have gotten started! Lisa is the Content & Marketing Strategist at Juicy Results and can usually be found writing the blog posts that no one wanted to write because they're intense, need thorough research and can't be explained to common humans without her help. She breaks down SEO, analytics and marketing campaigns to help you stay fresh, relevant and sane. Clarity is a key strategy. By focusing on core values and message purpose, you can really elevate the level of content. The team at Juicy Results is excellent and maximizing your on line strategies through these objectives. Doug, all of us here at Juicy thank you for your compliment! We're fun to follow. Go ahead, try it! Like Us? Let it Show! Each month we select the best small business marketing advice to share and alert you to upcoming Internet Marketing events.